An announcement many video editors have been waiting for -- Final Cut Pro X is already available in Mac App Store, along with Motion 5 and Compressor 4. Apple launched three Mac applications last Tuesday: The Final Cut Pro X ($299.99), Motion 5 ($49.99), and Compressor 4 ($49.99). These apps are said to replace the Final Cut Studio version, which only contained the Final Cut Pro 7, Motion 4, Soundtrack Pro 3, Color 1.5, Compressor 3.5 and DVD Studio Pro 4. 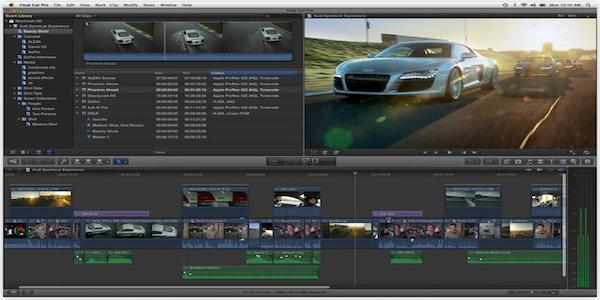 The new Final Cut Pro X features key sound editing and color grading components (also found in Color 1.5 and Compressor 3.5), allowing users to “use a single application for the entire post-production workflow.” While the latest Final Cut product now have basic DVD and Blu-ray authoring abilities. This $300 app can do a task that is 4x the load of the main software, which is sold for $1,000. Final Cut Pro X brings an array of great features, including background rendering, which allows you to continue editing while video rendering is in the background; Magnetic Timeline, entitles you to drag and drop clips without breaking the existing elements; and Smart Collections that lets you analyze and scan your clip library and group similar elements together. On the other hand, the revamped Motion 5 offers new effects and transition titles. Its interface was redesigned, as well, to easily spot effects in your project. While the new Compressor 4 features export options and a one-step streaming web playback output options.